Miramar Condo 201 is one of the finest Oceanfront Condos for rent available in Cozumel. Imagine waking up to a fabulous ocean view from your Miramar Condo 201 bed. This first floor, one bedroom, one bathroom condo has quality fittings and furnishings throughout. Enjoy your breakfast from the private ocean front Miramar Condo 201 terrace overlooking the swimming pool. Bring your laptop: now with wireless internet! Ocean Front Master Bedroom: This spacious bedroom contains a very comfortable king sized bed and one futon sofa bed. The elegant minimalist décor enhances the fabulous and relaxing ocean views. 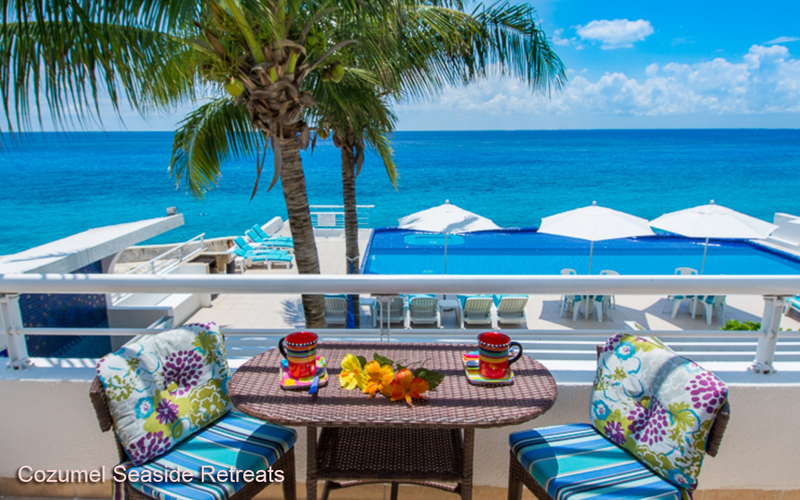 Private Oceanfront Terrace: Enjoy the breathtaking views and sunsets over Cozumel’s signature turquoise waters. Living Room: The modern living room with a bright Mexican vibe is very comfortably furnished, containing a beautiful flat screen TV. Kitchen: Fully equipped with everything you need to prepare all your meals! Contact us directly with no middleman. Escape the crowds of the hotels and relax in your very own direct ocean front condo. With easy access to town, excellent offshore snorkeling and fabulous sunsets over the ocean, Miramar condos makes the perfect retreat for your holiday. This was a great condo in a small development. The space was nice and updated and the complex sits just about 10 feet above the crystal clear ocean. The pool/ocean area is absolutely beautiful. Each night, you can watch the sun drop into the water from your back deck or the pool area. You can snorkel and see a huge variety of fish and coral (including a few moray eels) just a few feet from the unit. The island is also great. There are great restaurants and bars and a few spectacular local spots with great food, drink and prices. We have traveled a lot and this was one of our favorite places that we have visited. You will love it. A Fantastic place!! The condo has everithing you need, furnishings were very good, and the view is breath taking at sunset. You can jump into the ocean and do some amazing snorkeling right from the Condo. The pool is great and your view is amazing while in it, Great dealing with the people.. Highly recommend!!! kenia A. / Quiet, beautiful view! Awesome condo 201 overlooking sea and pool Beautifully appointed condo with everything you could need. Great location. We loved being outside of town where it was extremely quiet and away from all of the cruise ship traffic but close enough to pop into the heart of it all in just a few minutes. Bed was great--a rarity in condos we have found. Waking up to the sea view each morning was a treat. A/c worked great but we found it was nice to have it turned off and all the windows open--fabulous breezes. Would definitely stay here again. carol t. / Great overlooking sea and pool! This was our second time in the same condo (201). We found it 3 years ago and loved the vacation. Came back this year after a massive search around the Caribbean for what we like. Close to town...but not too close. Quiet, beautiful North end. Pool space is usually quiet and adult. Jump right in the ocean and come back up the spiral stair case. Some of the best snorkeling anywhere on the island I found within 100 yards. the grounds are maintained with precision. One thing....they really need to replace the poor grill with a nice propane grill by the pool! I'm taking time to write a review because the reviews of others have helped me plan trips and avoid problems....giving back. Thanks. - Stayed two weeks. - pictures of the place are accurate, there are cool steps down to the ocean and 10' dive platform from the pool deck!!! - 201 is great because it's at ground level on the street side, but one floor above the pool so you have a great view of the ocean, Cancun in the distance, cruise ships coming and going, but also the pool area. - Snorkling is excellent in this area. We snorkeled many various places on the island and even took a snorkel boat out on three locations...the snorkeling at the condo area is as-good- or better than you'll find. We would walk 10 minutes down to the Marina and climb down the wall but the fenced gas tank (next to the castle pool). The current takes you down to Miramar (usually). - Maid service every other day was excellent quality - property managers are effective and helpful. - staff keeps the grounds very clean and organized. PRISTINE. RECOMMENDATIONS for your trip: - we rented a scooter for $20/day (250pesos). Started with a week rental and kept the whole time. Very convent to get around. Yes, I suppose this isn't for everyone.....but its annoying to read that "they are dangerous and you'll put your eye out" - EAST side beach is a must visit. Also had someone say its "dangerous to swim over there! "...THATS BULL. Again, it's not for everyone and I sure would be choosy on the where and what day, but there were many days it's about like the Pacific with the normal undertow. And many places are sharp coral so are not desirable....but some sand beaches can be found. - Corona Beach - is a good place . Damian S. / Amazing view, pool and snorkeling-on-site! Lovely decor, new patio set was appreciated. Staff on site were extremely attentive and helpful. Beautiful views and comfortable surroundings. Quiet location, mostly adults. Close to town. The condo was comfortable, clean, safe and overall a wonderful experience. The staff is completely kind and helpful. They went out of their way to make us feel comfortable. The kitchen had everything we needed to make our meals. We like to carry a lunch when we go out for a day of diving. We highly recommend the condo and will return again. What a magical place! I absolutley loved my relaxing time on the terrace overlooking the Caribbean Sea. The condominium had all the amenities of home with a wonderful staff to help you. It was the most comfortable vacation I have ever had, thanks!!! We just completed our third stay in a row at Condominios Miramar on the island of Cozumel and booked a condo for next year immediately after we arrived back home -- we love it that much. For three consecutive years, we've stayed in three different units in this very small condo complex about a 30-minute walk north of town and it's our number one choice for accommodations on the island. The condos are spacious, clean, well-maintained and views of the ocean are spectacular. We liked Miramar unit #201 in particular because it's perfect for two adults, it's one level with entrance at street level in front and on the second level in back on the ocean side. The housekeeping and maintenance team are the best. Hard working, very friendly and they seem to enjoy our sincere and continuous attempts to improve our Spanish language skills! If you stay in any of the condos at Miramar, please be generous with tipping the maids and the maintenance crew. They work so hard to keep the place spotless and inviting -- they deserve the extra "thanks."